Well, it's that time again. The end of summer is ushering in the start of another school year. This year two of my grandsons are starting kindergarten. Zeke began Monday and Jake starts Tuesday. I know they will both do well, just like my two granddaughters, Karaline and Megan, have done before them. That will make half of my grandchildren officially in school! To celebrate school being in session, I made these cookies for all of eight of my munchkins, students or not. I want them to know that grandma's love is with them each and every day. I was going to make the cookies with the look of notebook paper, but decided to use the paper style that primary students use in school. It was a very easy cookie to make and I love how they turned out. Simple and cute is my favorite cookie combination! 1. Roll out the cookie dough. Using a rectangular cookie cutter, cut out the cookies from the dough about 3/8-in. thick and place on parchment lined baking sheets. 2. Bake cookies at 350 degrees for about 15 minutes or just until starting to brown around the edges. Let cool. 3. Mix royal icing (Set a small amount aside for the black lettering). With a #3 tip, outline the cookies. Let dry for about 15 minutes and then fill the cookies with the royal icing. 4. Let cookies dry completely 6-8 hours, or overnight. 5. Using a blue edible marker (I used AmeriColor Gourmet Writer) and a ruler, make solid blue lines and broken lines across the cookie (as pictured). I used a real page from a primary writing tablet to serve as a guide. 6. Add black food coloring (I used AmeriColor Gel Paste Super Black) to the reserved royal icing. Mix well. 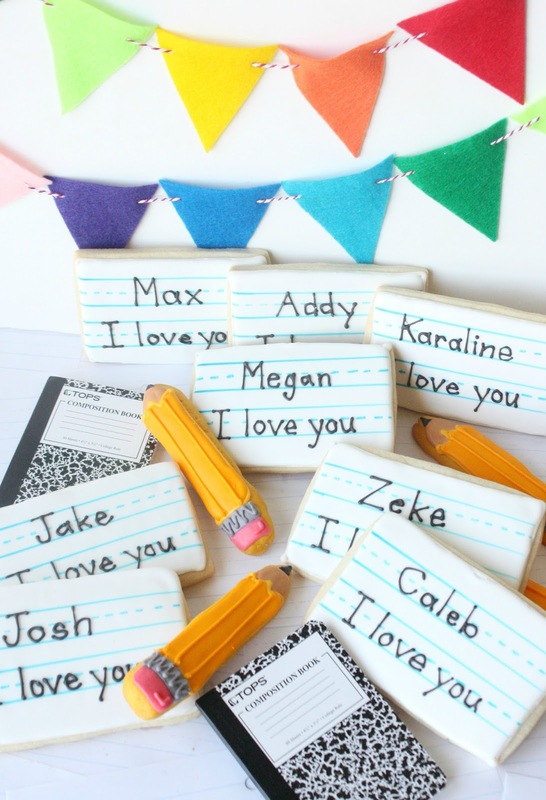 Using a small tip (1.5 or 2) add your messages to the cookies. Let dry completely. Share these cookies with those you love. I've no words. You're an artist dear! Oh my.. these are wonderful!! <3 <3 Kisses, and congratulations!! Too cute! I love that you make the grand kids cookies for the start of school. I think I'm going to follow suit and make some for my nephew. Thanks for the great suggestion! OMG sooo cute!! I am filing this for when my little one starts pre-K next year!! thanks for sharing! btw I LUV your blog! These are awesome! So creative. 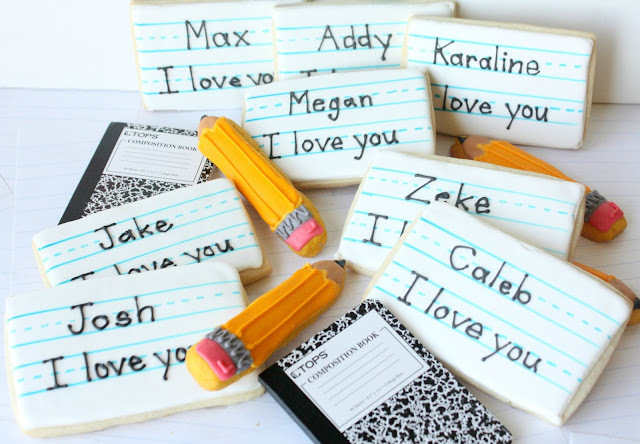 Loving these cookies... the perfect 1st Day of School send-off! What a creative back-to-school treat! These are so cute, and I'm impressed by how well the lines turned out. Using a food-safe marker was a great idea! Amazing Sue. You have outdone yourself again. Your grandchildren will have so many great memories of you. These are too cute to eat. They should be framed. I totally love these! Little notes are so special! Truly, these are some SWEET notes! Great idea! These are beyond beautiful! Love those sweet notes, Sue. So darn cute, Sue. I bet your munchkins loved them! I love how these turned out too and how sweet that you made them for all your little munchkins. Soooo soooo sweet :) You have some very lucky munchkins! When I came across this page I couldn`t believe that these are cookies! They look like tiny toys and only when I looked at the recipe I understood that these cookies can really be cooked. But I guess it is rather difficult to decorate these cookies or maybe there are some tricks to make the process easier? I think hubby would like to find a cookie love note in his lunch! So many possibilities.